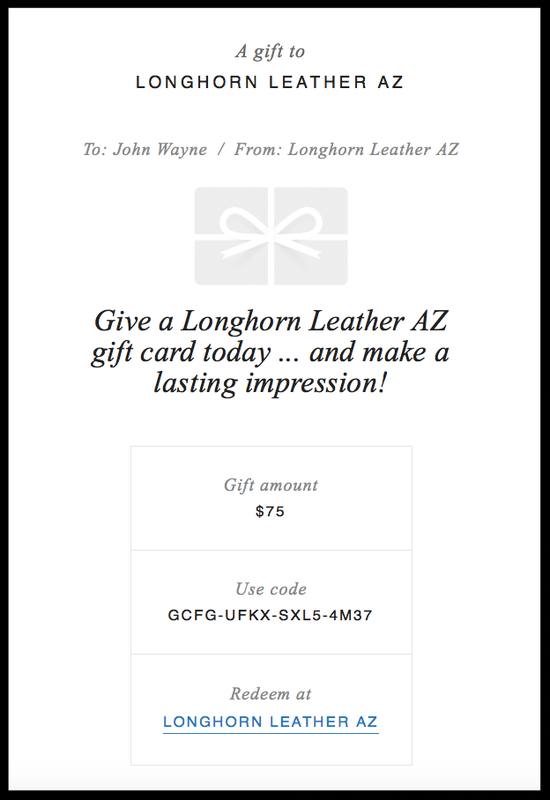 Give a Longhorn Leather AZ gift card today, and make a lasting impression! Gift cards are used as payment for purchases at Longhorn Leather AZ. Click “Order your gift card now!” and select the value. Email to You - you will receive an email with a printable .pdf of the gift card. Enter your email address and billing information. Once the recipient receives their gift card, they can redeem it by entering the gift card code at checkout. If the order total exceeds the gift card value, they'll simply pay the remaining balance. If their order total is less than the gift card value, the amount applied and remaining value will display on their order receipt.